Apple iPad Air 2 WIFI 128GB in Space Gray Model: A1566 - Perfect Working Order! 16/32/64/128GB WiFi or 4G Grade A/B. iPad Air 2. 4G Unlocked or Wi-Fi only. Item has been fully tested and in full working order. Device conditions explained. Apple A8X chip with two powerful cores and faster graphics. The Apple iPad Air 2 with 128 GB integrated memory, offers plenty of storage space for your downloads, apps, images, videos and more. It runs on the versatile iOS, which lets you access a large variety of features and apps exclusive to Apple users. 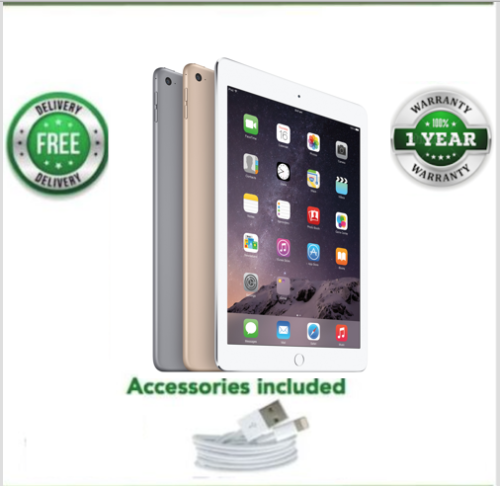 This Apple iPad is powered by the 1.5 GHz Apple A8X processor and has 2 GB RAM for smooth functionality and offers Wi-Fi and Bluetooth connectivity. It comes with a 8 MP rear camera and 1.2 MP front camera. Its 9.7-inch display comes with a resolution of 1536 x 2048 pixels and weighs only 0.9 lb. Was in very good condition for a refurbished Ipad and fairly easy to set up with a little help from my grandchildren. Still learning how to use it. I treated myself to this ipad because my tablet was useless since i have had this i dont know how i managed before, it is clearer to look at easier to work on and lasts longer battery wise. it lasts a good two days.wish i had bought one earlier. I purchased the iPad Air 2 to use as a music workstation; the power of the processor and the available storage memory is what I was looking for within budget. It does well laying sound in sampletank and having other tasks running in the background. I’m very please with the iPad Air 2 that I’ve purchased, it was still in original plastic wrapper. The screen quality’s fantastic and responds quickly when using the apps. Fantastic buy.